Resonant Cavity Type Microwave Dielectrometer calculates dielectric properties from resonance changes in the resonant cavity. By just inserting a sample material in the cavity and following the multi-step wizard of the software, one can easily obtain desired quantities. There are two types of components: oscillator type and network analyzer type. The oscillator includes a microwave signal generator and a detecter, and serves as a substitute network, thereby eliminating the need of a costly network analyzer. The network analyzer type should be used with a network analyzer of your own. an oscillator, a measurement cavity, a customized software, and accessories. a measurement cavity, a customized software, and accessories. Q1. What is the resonant cavity type microwave dielectrometer ? The resonant cavity type microwave dielectrometer is the system which measures dielectric properties at microwave frequencies. This system has 2 types, which use either a synthesized sweep oscillator (an alternative to a network analyzer) or a network analyzer. Q2. What are the system components of the synthesized sweep oscillator type and the network analyzer type ? Q2. What are the system components of the synthesized sweep oscillator type ( an alternative to a network analyzer ) and the network analyzer type ? The synthesized sweep oscillator type consists of an oscillator, which includes a microwave signal generator and a detector, a measurement cavity, a customized software, and accessories. This is a low cost type because it does not have expensive measurement devices. The network analyzer type sets up with your network analyzer to use. It consists of a measurement cavity, a customized software, and accessories. Q3. What is the measurement theory of this system? The measurement is based on the resonant-perturbation method. The resonant characteristic of the cavity, the resonant frequency and the quality factor will be changed when the material is inserted into the cavity. The complex permittivity can be calculated by the change of the resonance frequency and Q factor. Q4. What is the difference between this system and the conventional system ? The resonant cavity type microwave dielectrometer has highly accurate measurement software. By simply inserting a material into the slot of the cavity, and following an easy step-by-step operation of the software wizard, the measurement is achieved for complex dielectric properties very accurately and very simply. Q5. What is the tool to measure ? 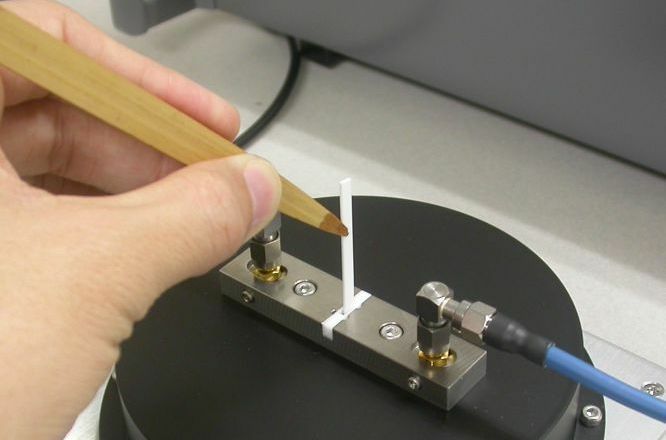 The tool to measure is a resonant cavity which has single-frequency point per a resonator. It is suitable to measure for thin films, multilayer structure materials, ceramics, liquid, various resin and powder. The measurement method was established by JIS (Japanese Industrial Standards) C 2565. Q6. How good is the accuracy ? The random error of the epsilon is estimated to be less than 1%, and the error of the tangent delta is less than 5%. Q1. What are the requirements for the sample material ? The measurement method by the resonant cavity is destructive measurement. The dimension of the sample to be tested should be larger than 80mm (L) × less than 3mm(W). Thickness is 0.05mm - 1mm. Q2. What are the limitations of the dielectric properties ? This system can measure relative dielectric constants from 1 to 30, and the loss tangent from 0.0001 to 0.1. Q3. Is it possible to try sample measurements ? Q1. Which network analyzers can be used for the microwave dielectrometer?